In this Grade 11 listed building the first floor flat is comfortable and very attractive. The cottage lies just outside the city walls of Canterbury, so it is within easy walking distance of all the city attractions, such as the cathedral, the new theatre, cinema, many good restuarants, museums, swimming pool, sports ground, beautiful city gardens, river boat trips etc. It is ideally situated for access to London, Ashford or Dover. Day trips to France are easy as there are both buses or trains to the coastal ports. It is part of an old hall house and has a pitched beamed roof. Sheets and Duvets available. Towels and kitchen cloths also provided. Overlooks a lovely garden but there is no access from the flat. Park Gardens very nearby. Local Services: Bus stop outside. Train service from staion 5 minutes along the opposte road to London Charing Cross 1 1/2 hrs or fast train to London St Pancras (50 minutes). Trains also go to coastal towns in Thanet. Take the M2 from London and turn off onto the A2 to Canterbury. Turn left at the first roundabout and go down the London Road. At the roundabout near St Dunstan's Church turn right. Go over the level crossing and the cottage is just past the mini roundabout on the right. 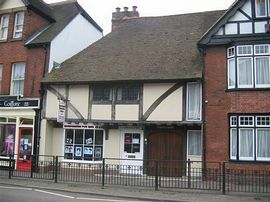 Templars is two houses beyond the Hospice Shop, next door to Westgate Hairdressers and opposite Kirby's Lane. For the summer tariff the cost would be £380 a week. For the Golf Open in July special rates would apply.Please enquire. Available for weekly letting from 11th June until the end of August. From Saturday to Saturday. None because this is the first year of holiday letting.